I hadn’t. Honestly. We were just drawing closer to Rotorua, which is atop some of the most geothermal land in the country. Soft white clouds of sulfurous (or as I called it, sulfurious ) steam leaked from everywhere. In fact we weren’t surprised at all when, on the second day, a powerful egg-y odor overcame our senses. We sniffled a bit, blinked our eyes, and kept walking past a crowd of loitering people on the corner. “Where are you going?” A woman called out to us. “To the park,” we replied. Of course there is more to the city than its infamous scent. There are so many shows, spas, activities, Maori attractions, and lodges that the city has earned the nickname Rotovegas. Perhaps the most iconic sight of all is the Bath House. The grandiose structure was built in an Elizabethan style and housed the country’s first serious foray into tourism: therapeutic spas. 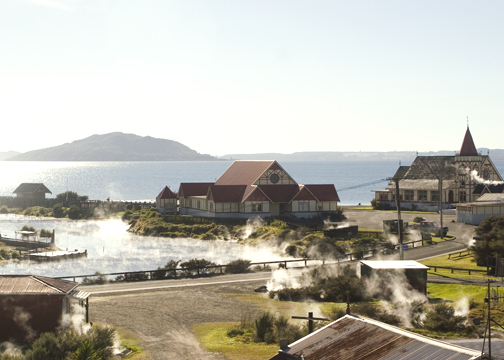 After being vacated by the Health Department in the 60s, it began its transformation into the Rotorua Museum. The lawn bowling gardens in front of the museum made me feel as if I stepped into one of my mother’s film reels circa 1950. However, the marble statues, grand staircase and ceramic tiles offered a glimpse of how lavish the spa had been in its heyday. It was a time when nurses wore starched uniforms, World War soldiers recuperated, and people strolled the gardens before tea time. The treatments ran the gamut from mineral waters for lumbago to electric baths for sciatica; and relief from nervous irritability was just a mud application away. After reading the benefits, Barret and I rushed over to the Polynesian Spa with a case of coldweatheritis. Whilst in a pool of sulfurous green water, we sat quietly, “so as to avoid any unnecessary disengagement of gases.” Convalescence never sounded so romantic. Polynesian Spa– Voted by Conde Nast Traveler as on the world’s top ten spas. 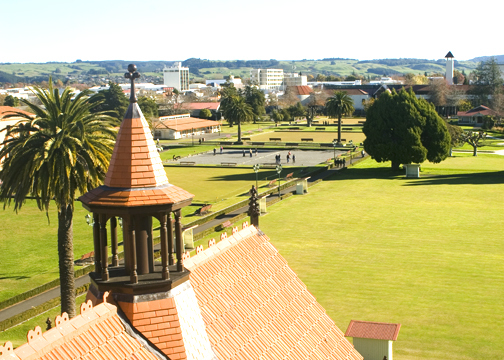 1000 Hinemoa Street, also located in the Government Gardens.